D.C. Circulator buses have fewer major safety problems than they did a year ago, but District leaders say there is still a long way to go. 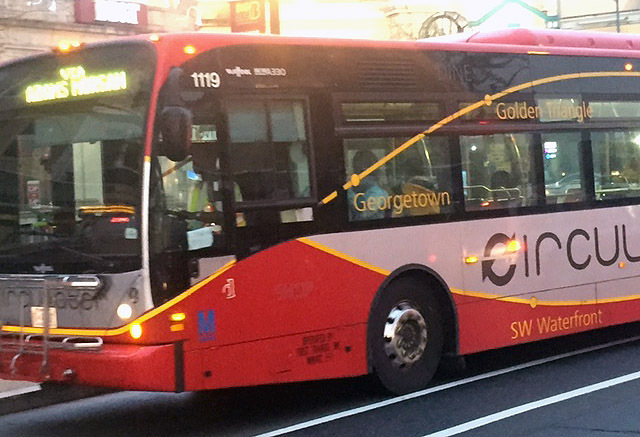 WASHINGTON — D.C. Circulator buses have fewer major safety problems than they did a year ago, but District leaders say there is still a long way to go. At a D.C. Council roundtable Thursday, Council member Mary Cheh (D-Ward 3) said the buses now average 0.27 major safety defects in the system’s most recent audit, down from 2.9 in an audit conducted last August that was first reported by WTOP. “The recently reported rate of A-level defects remains above the rate several comparable regional transit systems have shown and indicates there’s additional room, obviously, for improvement,” Cheh said. Part of the improvement can be traced to new buses in the fleet, and the District is planning to buy 40 new buses for about $30 million to replace the oldest buses, which are reaching the end of their minimum life. The buses might have lasted longer had they been kept in better condition since the Circulator service began in 2005. District Department of Transportation Director Leif Dormsjo said DDOT needed to be more aggressive in setting expectations for First Transit, the contractor that operates the service, even though Metro handles much of the direct oversight through a memorandum of understanding with the city. “No one knew who was actually in charge,” he said. “First Transit, for instance, is a company that is successful in many, many different places. They weren’t successful here because no one was demanding that they bring the A team, so now they’re bringing the A team here,” Dormsjo said. The change comes after Dormsjo met with the president of First Transit last month. District and First Transit staff have held twice-weekly meetings ever since, to ensure the planned changes, which include more maintenance staff and outside contractors, come to fruition. Dormsjo credits increased expertise in his agency and a stepped-up focus on the Circulator’s issues for the improvements since the audit last year, which found two significant problems. “One, the current maintenance facilities are inadequate; two, the contractor has not provided sufficient training for the maintenance needs of the fleet,” Dormsjo said. “While these improvements are noteworthy, DDOT believes that there is more room for improvement and will continue to press forward to reducing this defect rate even more,” he added. THE DISTRICT IS LOOKING for land that could be purchased or leased to provide a new maintenance facility. Although Dormsjo and council members believe the odds of finding something in the District that works are slim, if D.C. does control its own facility it could open up competition the next time the operations contract is up for bids. If no good sites are found by the time the request for space closes in late October, the search for space could extend beyond D.C.’s borders. Dormsjo said DDOT is in the midst of a wholesale evaluation of the system, including management, schedules and the system’s six routes. “While great attention has been paid in the past to extensions and new routes, our current focus is on fixing the system we have in place today and making it safe and reliable,” Dormsjo said. The D.C. Circulator is extending hours, though, beginning next week. On weekday mornings, the Woodley Park-Adams Morgan-McPherson Square, Georgetown-Union Station and Dupont-Georgetown-Rosslyn routes will now begin at 6 a.m. rather than 7 a.m.
On Friday and Saturday nights, the Georgetown-Union Station and Dupont-Georgetown-Rosslyn routes will run until 3 a.m. instead of 2 a.m.
Also, the Georgetown-Union Station line will run the full length of the route at all times. It had ended at McPherson Square after 9 p.m. The changes are partly in response to increased demand during Metro track work. DDOT hopes the expanded service will especially help riders looking for other options during the major service cuts along most of the Red Line due to a round-the-clock shutdown between NoMa-Gallaudet and Fort Totten coming up from Oct. 29 through Nov. 22.